When you are looking to hire employees that will be engaged with your company’s vision and goals, you can find a lot out during interview. Of course, knowing what questions to ask in a job interview is only half the battle. You must also assess the candidate’s responses to these questions to determine whether he’s the right fit for the job and for your organization as a whole. Here are a few ideas to help you make the best choice! Assign questions designed to pinpoint helpful behaviors, education, skills, and traits a weight of 1. Questions meant to uncover important behaviors, education, skills, and traits receive a weight of 2. Questions designed to reveal critical behaviors, education, skills, and traits get a value of 3. For example, suppose you’re interviewing candidates for a position as a brain surgeon. In that case, you might assign questions designed to illuminate the candidate’s skills and education a weight of 3, but assign questions that pertain to revealing a candidate’s personality a weight of 1. Or, if you’re interviewing candidates for a position that involves working from home or a remote office, you might weight questions that pertain to independence more highly than those related to cultural fit. In addition to weighting the questions, you’ll want to rate the candidate’s answers. Generally, assign a rating of 3 to answers that indicate an excellent match, a rating of 2 to answers that are a good match, a rating of 1 to answers that are satisfactory or acceptable, and a rating of 0 for answers that are unsatisfactory. So, how do you use this info? 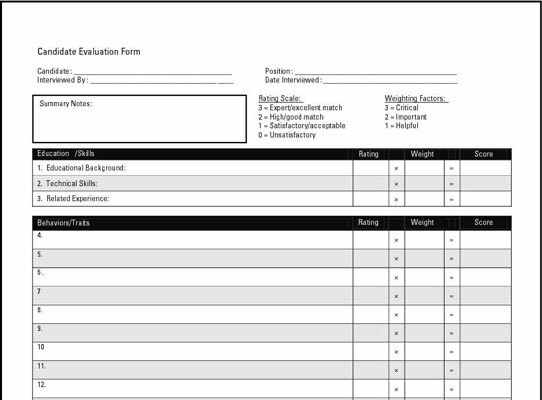 If you refer to the figure, you’ll notice that the candidate evaluation form includes a “Rating” column, a “Weight” column, and a “Score” column for each question. To score the candidate’s answer to a question, you simply multiply its rating by its weight. For example, if a question is weighted a 3, and the candidate’s response is a 2, you would enter 6 in the “Score” column. You can then add the scores for all the questions to determine an overall score for the candidate. This score can then be compared to the scores of other candidates to determine who’s the best fit.